EDMONTON - Emergency Response Assistance Canada (ERAC), in conjunction with Canadian Pacific (CP), today conducted a rail emergency exercise as part of ongoing ERAC responder training in the event of an incident involving a rail car carrying flammable liquids or gas. 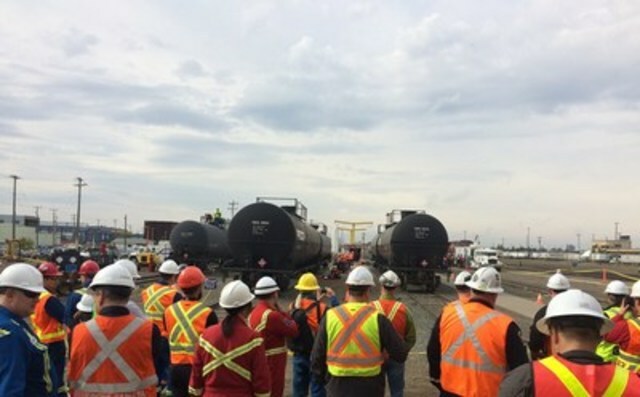 ERAC Response Teams, Technical Advisors and Remedial Measures Advisors from across Alberta participated in this full-scale hands-on training exercise involving three simultaneous controlled transfers of flammable product from rail cars. "Rail Incidents involving flammable liquids and gases, although very rare, can happen at any time and any place. If they do, Emergency Response Assistance Canada is capable of responding with highly-trained and experienced responders," said Spencer Buckland, ERAC President. "Controlled transfer exercises provide our responders with critical experience to ensure they are ready to act when an incident occurs." "CP is proud to partner with organizations like ERAC to further enhance the skills of our first responders and contractors in the event they need to respond to dangerous goods incidents," said Glen Wilson, CP Assistant Vice President Environmental Risk and board member of ERAC. "CP's network of contractors are on call 24/7 for emergency response services; we have expert personnel and specialized equipment for the purpose of initial product containment, recovery and transfer." Edmonton Fire Rescue Services and Strathcona County Emergency Services also participated in the exercise.